Another week, and again not much sewing done.All I have achieved is this tiny 2" X 2 1/2"
corner stone for the Frolic group quilt. My interpretation of Charles 1st. So here is a round-up of what some of the girls were doing at the Bee this week. 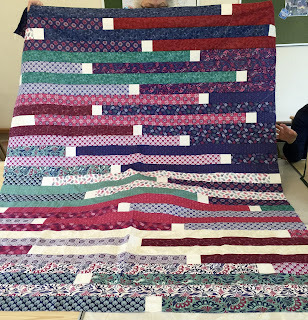 Ann had put this jellyroll top together and I like the little 2 1/2" blocks splitting them up. 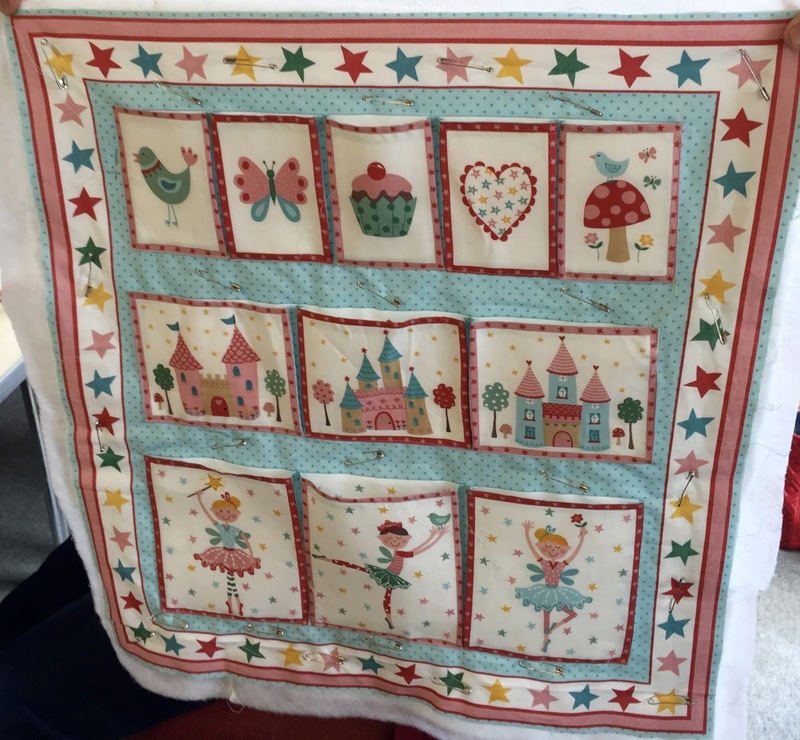 Pippa was putting the binding on her baby quilt for a boy, (the pattern is called Fiona) and is very popular with the Bee group. I think all of us have made it at some time and everyones looks so different. 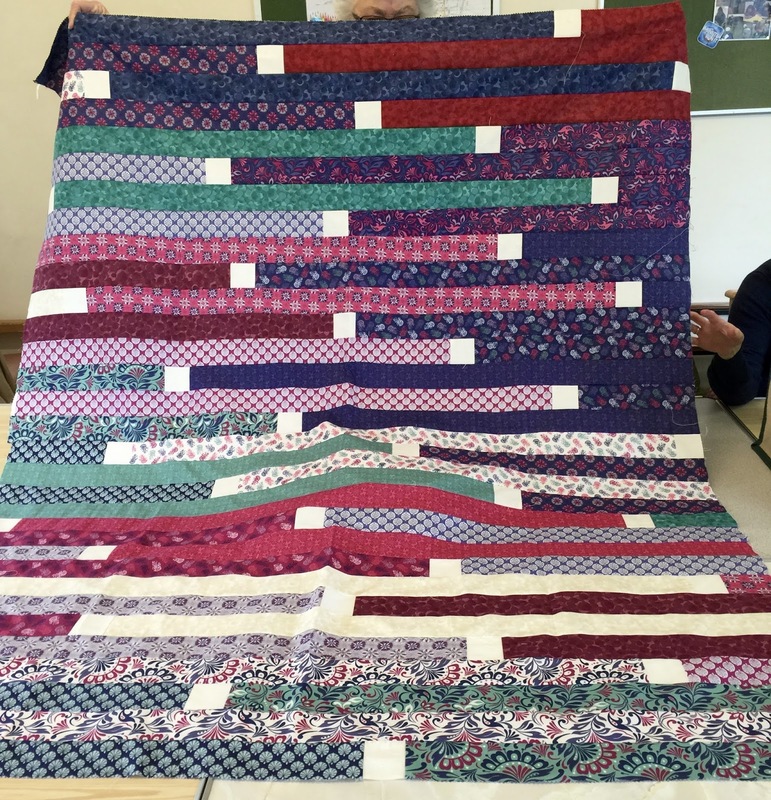 Close up of Pippa's quilt. 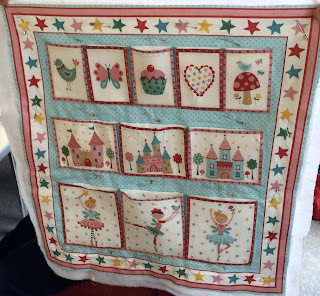 Maggie was hand stitching around the pockets on this wall hanging for her Gt Granddaughter. 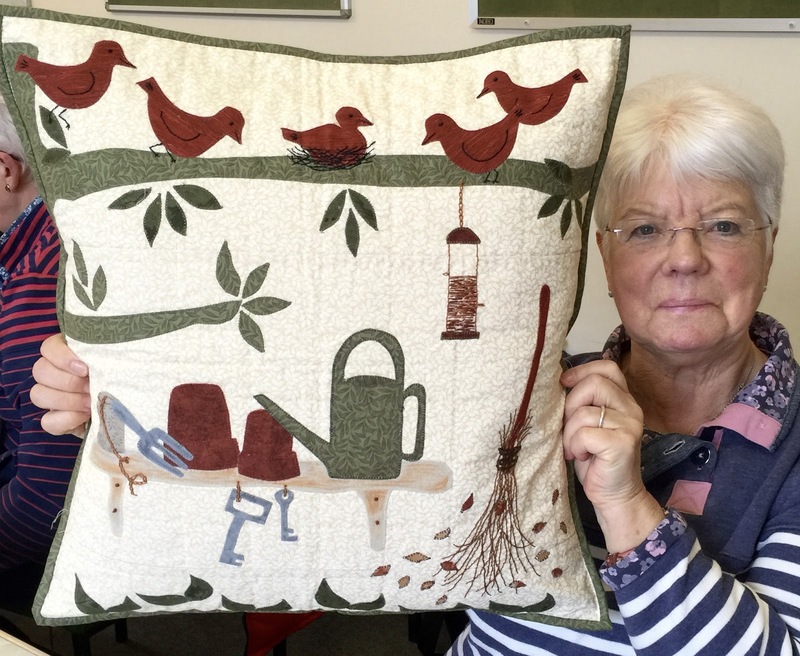 Jenny was putting the finishing touches to yet another garden chair cushion , I think her 6th. Easter is now with us, and the ladies of our village have been decorating our church for tomorrow's Easter Sunday Service. I have been decorating the same window for the past 30 years. Every year we wonder if the daffodils will be out, and of course they always are..
On that note I wish everyone a lovely Easter..
Not much sewing done indeed, but plenty of knitting. "Why, oh why, did I choose 2ply yarn to make this shawl", but on reflection, now that it is finishes and in the process of being blocked, I am quite pleased I did. 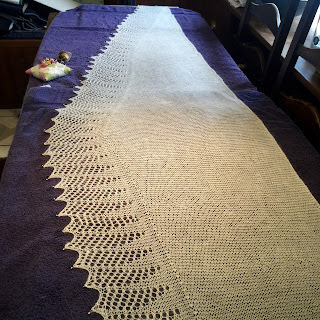 It was very difficult to photograph, as you can see, and seemed never ending while knitting. But it is finished and thats another thing off my to Do list..
Good things have happened this week. 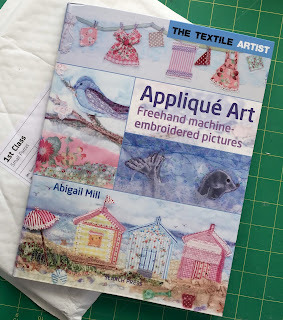 On my blog list, you will find Patchwork Allsorts and Christine was having a give- a- way, and as I usually comment on her blog( she does such lovely work), I was thrilled when I won the Appliqué Art book which Christine was giving away.. The author is Abigail Mill and a lot of her inspiration comes from Suffolk which was fun for me as you know we live in Suffolk. Our last guests ever came to stay in our little cottage yesterday. They are friends and came with a lovely gift of Suffolk Black Bacon, Oh! My it was delicious we had it for breakfast. Though it is a little sad that we will not be continuing to let out the cottage, we have met some lovely people over the last 17 years and we will miss that. 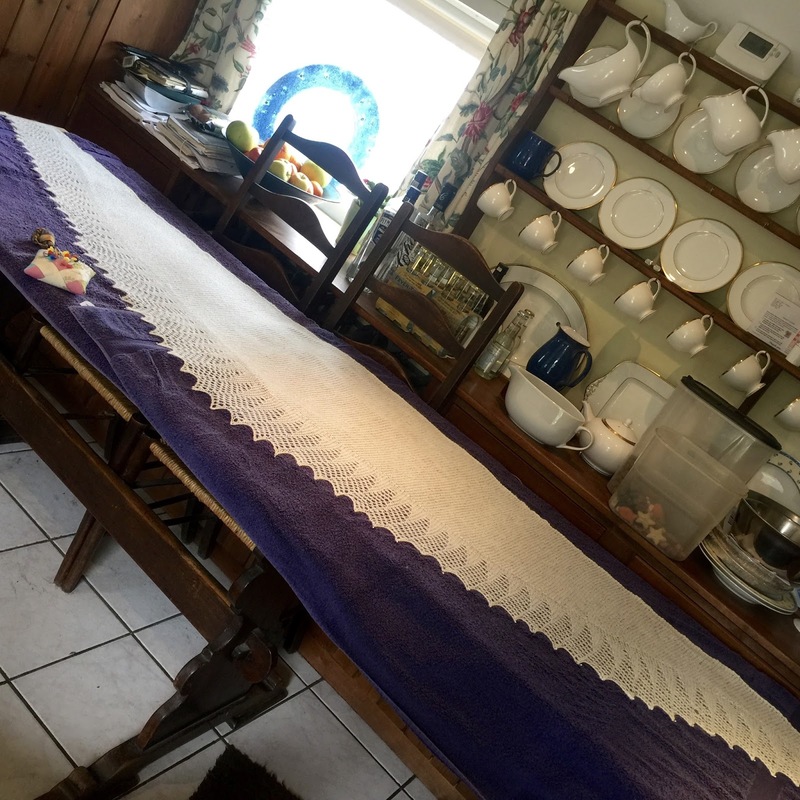 There will be more time for sewing and knitting and of course the Garden..